Is it 2002? Nope! But YES I am wearing a snazzy backpack. I think there was a time where backpacks kind of just left the face of the earth - or maybe I just left school? Whatever it was.... I didn't own any. Flash forward to 2015 and Kirstie is LOVING those handy bags once more and is totally in love with this newbie. 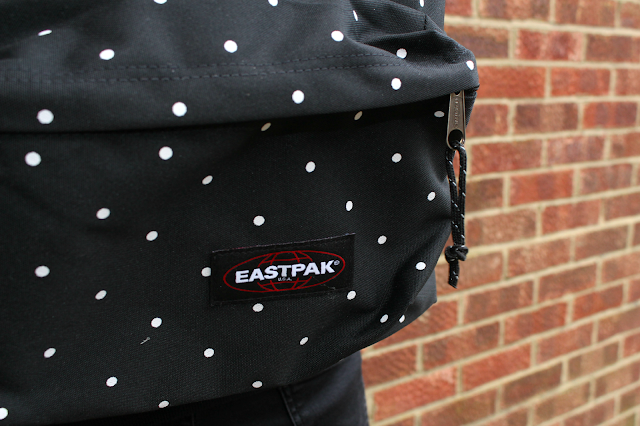 This dotty little number is from Eastpak - a well recognised and loved maker of backpacks... you guys must recognise their little logo on the pocket there! I love how comfortable this bag is - it has a padded back which is probably my favourite feature, it makes it so much nicer to wear. The backpack features the large inner compartment and the zipped front pocket (the best place for your lipgloss and keys!) and can fit so much in! The dotty pattern is great, being black and white makes it subtle but the spots give it that something different about it - I don't think I'd like it as much if it was just plain black. We all like to have night's away from home, I still regularly have sleepover's with my best friend (even though we are in our 20s) and this is the handiest way to take all my essentials! My handbags are never big enough and I don't want to be taking 5 different bags to pop out for the night so this is perfect. I took a backpack to London earlier this year when I went to see Taylor Swift and it was the perfect size for everything I needed.... and I don't pack light I tell ya! Ooooo even writing that has made me want to go on holiday! But yes, hand luggage is always a tricky one for me. You have most of your bits and bobs in your suitcase but you still what those few important bits with you.... I mean I never trust my make-up going in the hold.... what if they loose?! Backpacks make travelling so much easier, you are already carrying your passports, your tickets etc etc so it's nice to just have a backpack to pop on and not worry about having something else in your hands or on your arm! If you hadn't heard yet.... it's now 5p for a carrier bag here in England! I've spotted so many people wearing backpacks round town now and it's such a good idea, especially if you are picking up a small food shop! Plus it's alot easier to carry home! What do you think? Do you guys own any backpacks? This is such a cute bag! Im loving the monochromatic look. I love backpacks and I am really glad they are back in fashion. I agree with you on all three uses and they are so easy to carry. Great post. Loving that backpack, but also loving your outfit! I'm in desperate need of a new backpack constantly travelling up to my boyfriends. I love how simple the design is on this one too. Oh you look like such a babe! I have a backpack and I absolutely love it. It means I can shop and use two hands properly haha!